Easter is coming up this weekend, and many of us are filling our baskets with all sorts of goodies. Many Easter treats are loaded with high fructose corn syrup, artificial dyes and flavors, and GMO ingredients. You don’t have to give in to the toxic candies! You can still enjoy some Easter treats without feeling too guilty or sabotaging your normal eating habits. Chocolate is one of the most popular Easter candies. If you consume the right kind of chocolate, you can actually gain some health benefits, as well as enjoy the wonderful taste. Raw cacao powder contains theobromine, which is an anti-oxidant that also acts as a mild central nervous system stimulant. Raw cacao powder also contains phenethylamine, which is a serotonin-like chemical that boosts mood and increases overall feelings of pleasure. Dark chocolate contains both theobromine and phenethylamine, but in smaller amounts than raw cacao powder. Raw cacao powder has four times as much anti-oxidant power as dark chocolate. 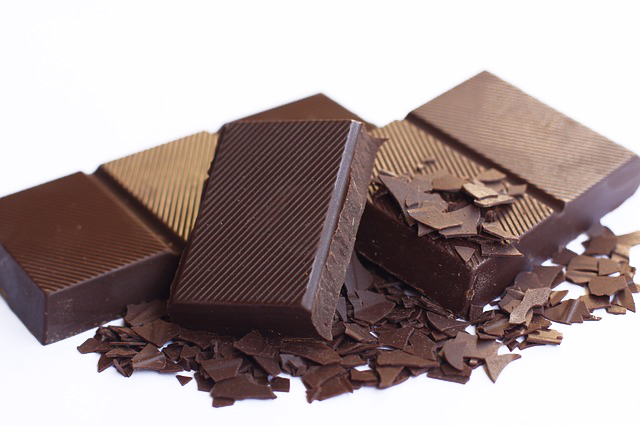 It also contains more protein, calcium, carotene, thiamin, riboflavin, and magnesium than dark chocolate. Both raw cacao powder and dark chocolate have the added benefits of decreasing blood pressure, increasing HDL and lowering LDL, improving vascular elasticity, and improving insulin resistance. This does not mean that diabetics and people with high blood pressure should gorge on chocolate! Instead, reach for raw cacao powder, which has all of the health benefits of dark chocolate with almost none of the sugar. Milk chocolate does not contain the level of anti-oxidants and beneficial phytochemicals that raw cacao powder and dark chocolate do. Milk chocolate contains more sugar (or corn syrup), partially hydrogenated oils, and dairy products, all of which block the absorption of anti-oxidants. This cancels out all the health benefits of raw cacao powder and dark chocolate. White chocolate contains no cocoa solids, so it isn’t truly even chocolate. This also means that it has none of the beneficial phytochemicals that raw cacao powder and dark chocolate contain, so it has no health benefits. Melt the coconut oil, then place in blender or food processor with all other ingredients and blend until smooth. Pour into paper or silicon muffin cups, filling to 1/2″ full. Chill in refrigerator for 30 minutes or place in freezer for 10 minutes. Store in a sealed container in the refrigerator. Optional: Sprinkle coarsely-ground sea salt over each fudge treat before chilling.